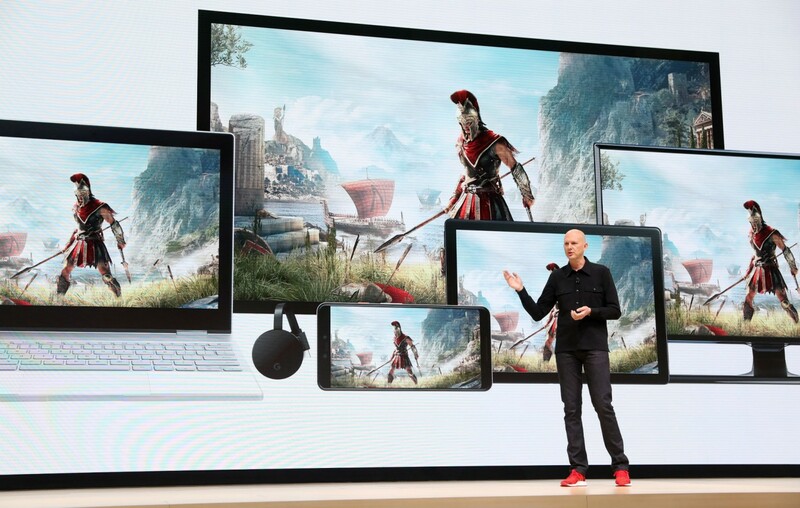 Announced two days ago at the keynote address, the Google Stadia streaming platform is the talk of the 2019 Game Developer's Conference. Both optimists and pessimists have hot takes on the viability of a service that ditches the need to buy a physical piece of hardware and instead jacks gamers directly into a cloud server. To learn more about how Google plans to address potential roadblocks like latency, data cap overage rates, and building a strong first-party library of video games, we spoke with VP Phil Harrison. Let's talk about the name and the logo. What made you decide Stadia was the right name? And what was the meaning behind that name choice? I think it's a perfect name. It was the culmination of a huge amount of creative work by various teams. Naming things is unbelievably hard, because you come up with a name. Then somebody else has it. Or you come up with the name, and it means something weird and a different country. There's a lot of impediments to landing on a great name. But "Stadia" is the plural of stadium. The way that it resonated with me was this idea of a stadium – and you saw this in our film that we debuted yesterday – this idea of entertainment being either about sports, but it's also a stadium as a place where you could go and see a rock band. It doesn't have to be about seeing a football team or basketball team. Also, you can either be on the pitch as a player or you can be in the audience as a viewer. So, this idea of watching and playing, being merged into one platform, which is the product truth of what Stadia is about. And this notion of a stadium meaning, you and I could be sat on the couch playing a game and have the greatest combative rivalry or shared exhilaration moment. For that moment in time, this couch is the best stadium in the world. I thought that was great, this idea that we could take that name and really run with it. Then the logo, the meaning of the movement of the logo. Obviously, there's an S in there, but then there's this, almost graffiti mark. But then there's also the idea of a banner. If you look at it carefully, you can see it's like a flag being waived. So, there was a lot of double meaning in there. And I thought it came together really well. You have an interesting background for a project like this because you worked in the platform wars, in the old console days, you've been on both sides of that. You were an investor and advisor to Gaikai. You understand the fierce sense of loyalty certain consumers have towards brands, and over the years as these programs have gotten more intense with PlayStation Network, Xbox Live, their friends are all on these places, their back catalogs are on these places. What do you see as the best way to chink away at that armor and get people over into something that's new? I think it's very simple. We have to deliver great games, great experiences, in a great way, and completely respect that the social graphs are sticky, but we're not asking anybody to buy any hardware. We're not requiring people to buy any hardware. Of course, we're asking them to [points to the Stadia controller] so, I think those allegiances that you talk of are historically around a very significant capital investment that gamers had to make. The frequency of those capital investments is going up. They're having to be made more often. Stadia's core value proposition is to eliminate the box. Eliminate the barrier to entry. Allow you to get the same highest quality game experience irrespective of the kind of screen that you're on. I hope that that was clear in our presentation, that that's not a future promise, that's a today. If we can bring games that are familiar in a very good way on Stadia and bring games that are new that really deliver on the promise of, your platform is a data center, then gamers, we hope over time, will see that this is what a true new generation platform looks like. This isn't the first time we've had a major GDC announcement centered on streaming. Ten years ago, OnLive had a press conference revealing its streaming technology, and Steve Perlman talked about the chief challenge to streaming – solving the problem of the speed of light to get latency down. What do you think has changed in the years since those early attempts at streaming? I think I was in the audience at that presentation. What has changed? First of all, this is real. Stadia would not exist if we weren't able to stand on the shoulders of giants with what Google's been doing for the last 20 years. Google's fundamental investments in the fabric of the data center, the networking that connects the data centers together on our own private backbone using our own fiber optic cables. The breadth and penetration of our infrastructure to the furthest edge of the network, not just in the massive data centers that people think of when they think of a data center. The seven and a half thousand locations around the world that shorten the touch point between gamer and game. Although the speed of light is the one thing we don't control, we can cheat the physics of it to a certain degree by getting as close to the gamer as possible. That's why having a studio of the pedigree of id Software on stage saying, "We were skeptical, we tried it, we developed for it, and we're now convinced," I think is the best message that you could hear. It doesn't have to come from us. It comes from a very respected creator. You touted some impressive modern benchmarks in terms of performance with 4K, HDR, 60 frames per second, but that obviously to some degree is dependent upon bandwidth and the speeds of the internet service provider that people have. If you're going to be invested in Stadia, what baseline ISP speed should you be looking at? We proved with Project Stream that we could get 1080p, 60 fps for around 20 Mbps. We will get 4K, 60 fps for around 30 Mbps. Obviously, if you don't have a 4K TV, you can stream at 1080p, and you will use less bandwidth. We think that gives us access to hundreds of millions of potential audience. What has been the technological leap that's allowed you to do that other than the footprint of the network? Have compression techniques changed dramatically in recent years? Very much so. It's partly the algorithms for compression, Google has been a leading contributor and collaborator on some of the advanced open source video codex that are being propagated around the industry, and also some fundamental investments that we make at the hardware level to make it possible. Obviously, the United States is a unique challenge because broadband providers have so much land to cover in this country as opposed to countries like the United Kingdom or Japan. There are usually dead zones where devices don't work as well as in city centers. What do you see as solutions for people that maybe live in more rural areas where they're not getting that larger pipeline? The way that we think about it is, if you have a really good YouTube experience today, you will have a great Stadia experience. We acknowledge and respect that that doesn't reach every corner of the world, but there's a rising tide and hopefully, internet infrastructure would continue to grow out further and further into more rural areas, and then there's some really useful enabling technologies, potentially around 5G that could even accelerate that further. It's unfortunate that we won't capture everybody day one, but our commitment is to get as close to everyone as we can. Let's talk about 5G, because the theoretical speeds that they tout are certainly eye-popping, but there are so many X-factors of where that speed is going to be in practice as opposed to theory. Whether it's how many nodes there are, the quality of a person’s router, how much of the infrastructure an ISP like Verizon or somebody else has built out. How much faith do you have in that to really be a game changer? On paper, it does look like it's going to be a significant factor, but until we've had a chance to really test infrastructure that is outside of laboratory conditions, it's impossible for me to comment. How much are you worried about data caps and throttling? We ran into a problem when the Xbox One X launched where editors redownloading a bunch of games in 4K were suddenly getting notices from Comcast that they were already over their allotted data cap for the month. Is that something that gamers are going to have to be aware of if they sign up to a game streaming service? I think ISPs have been really proactive and somewhat responsive as well to the reality of the market. When music went to streaming, bandwidth caps lifted. When video TV went to streaming, caps lifted, and I think we'll continue to see that evolution. Plus, as we just talked about, with 5G potentially adding some competitive value into the marketplace, I think this will get better over time for everyone. Are you hopeful that net neutrality gets restored? Congress is entertaining a new bill right now. I'm not going to get drawn into that conversation. During the presentation, we were introduced to a handful of developers working on Stadia projects, but you showed a bunch of icons of games like, "There's an arrow to the knee. That's clearly Skyrim. That looks like a Red Dead emblem." Why didn't you show more of the lineup? Our code name for the event was PBA, which was Platform, Vision, Announce. We wanted to announce our vision for the platform. We wanted to communicate some new and in some cases quite complex features about how games and game watching are going to interrelate in the future. And we chose to amplify or illustrate those features with certain games. So, we had NBA 2K showing how you can come in from a YouTube streamer, creators subscriber list, into playing alongside them. But don't read too much into which games we chose or which games we didn't show. In the summer, we will be focused very much on the games. The lineup you'll be able to play at launch, and shortly thereafter. When you say summer, are you planning to be a participant at E3? We'll be back in the summer. Every time a new platform appears, the predominant thing that seems to sway people toward it the thing you alluded to in your first statement – content. What is the edict for the first-party studio that Jade Raymond is leading? Is their job to maximize the full potential of this technology with quadruple-A experiences, or are you looking for more of a shotgun blast approach where you want a lot of new content that comes really at a faster clip more like how a Netflix pushes content? Initially, it is to bring the best of Google to game development. So, that a game cannot tick every box, of all the features that we talked about yesterday, but thoughtfully and selectively act as a beacon and as a lighthouse for those technologies. So that a gamer can see, "Oh, that what's meant by the data center is the platform." And that means that game developers will be inspired by what we do. As Jade correctly shared yesterday, we in turn will share that technology back out to the game development community. Everyone then lifts faster. That's the reason for doing it. We don't have to cover every genre. We don't have to be the premium or predominant supplier of games on our platform. But if we can have those amazing experiences, that really lifts everyone, the Gran Turismo of driving that is the preeminent high-quality experience that everyone goes "Okay, that's better than I could have done elsewhere." Those are the kind of things we want to do. Jade obviously came on very recently. Are these early days for that studio? She was on stage on her seventh day. Has that division been running without an appointed leader for a while, or is this the very beginning for that group? We've had producers and related talent working inside of Stadia, inside my organization, for quite a long time. We're working initially with external developers on a commercial arrangement. And now we're building our own studios, where we will be putting our own talent into a Google Stadia Games and Entertainment. Which is so exciting to be able to just get that off the ground now. During one of the montages during the presentation, you showed some esports events. The biggest games on the planet right now are competitive games like Fortnite, League of Legends, and Apex Legends. Do you feel like your latency is at a place where competitive gamers are going to look at this as a viable platform to play on? Absolutely. I think the pinnacle of esports is guys in logo t-shirts sitting in custom chairs on a stage, and I'm well aware that they often buy the kind of mouse which will give them a tiny edge and they will have an active mousepad because that gives them a tiny edge. Those are an amazing aspirational place to be. But for now, I think we have the 99.9999% of everybody else that we can focus on. Everyone is curious about Stadia pricing. Are we going to be buying individual games? Is it going to be a subscription service? Is it going to offer both? I'm not going to go into the details on that today. We'll definitely be sharing that in the summer, but we've spent a lot of time partnering with our publishers and developers to come up with the right model for them. And we've done a huge amount of research with gamers as well. What sort of incentives are you using to lure third parties to be a part of this opening debut of Stadia? We've been able to share our vision with developers for quite some time. All the folks you'd expect. Some that you wouldn't expect have been disclosed on what we're doing with Stadia. I'm pretty thrilled with what we've got coming. Tell me what you think when we share it in the summer, but I think the commitment, the lineup, and the long-term promises is phenomenal. You've been a part of product launches before where it seems like there's usually a ballpark of 30 games or so that come out in that launch window. Are you doing things differently this time? I don't know that there is a scorecard of you have to have this many games to launch, but it's having the quality, the breadth, the brands and games that are maybe familiar from a previous generation now being re-imagined for a new generation. Having the right balance between those, I think, is going to be the trick. Are you aiming to have game experiences for every demographic at launch, whether it be games targeted towards kids, game geared toward competitive markets, or single-player experiences? What kind of mix are you looking for? Let's talk about that in the summer. You will see that we are more focused toward the higher end, enthusiast, core gamer. We're not going to be covering all bases day one. I think it's fair to say our lineup is going to be focused on slightly older or more committed gamers. But it's important that we land there well. Then we can scale from that point. 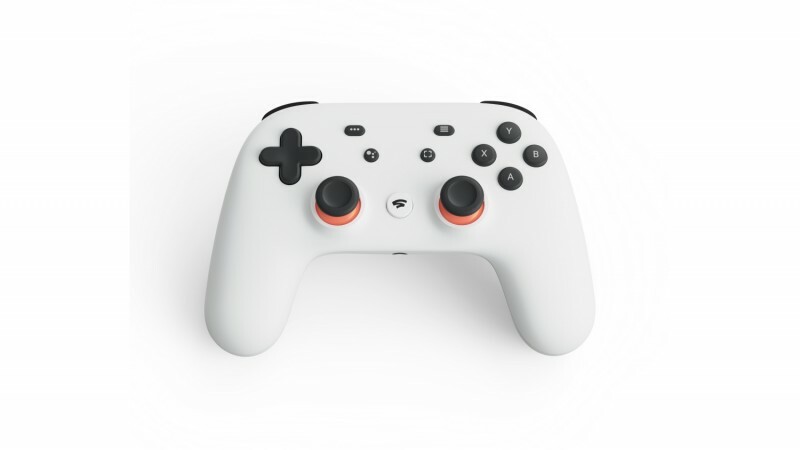 When did you start designing the Stadia controller? That predates me. It's been underway for at least two years. It's entirely in-house built and designed. I think the team has done an amazing job with the ergonomics. Inside there's some very clever technology, as I've talked about, that connects via Wi-Fi to the data center. But the ergonomics of it are fantastic. Are you talking to the high-end, third-party manufacturers like Scuf, who deliver those extra features people want out of their, say, first-person shooter controllers? Over time, I think we will see some third-party controllers. Our platform supports HID USB controllers from day one. Coming from a person who has like 42 different devices because I'm a technophile and knowing there are multiple devices that the controller can pair with, how does it know which screen you're intending to play on? It’s very clever. There's some technology that will know which screen you want to play on. You can obviously expressly say which screen you want to play on, but there's also some technology that just enables that to happen seamlessly. There are maybe scenarios where you might have a primary game screen that you want to use all the time, but you then want to move quickly to a laptop or to another screen elsewhere in the house. Our platform supports that. You're supporting all kinds of controllers, but some of the devices you support are touchscreen devices. Will there be touchscreen interface with some Stadia games? But the opening salvo, you're focusing on more controller experience? One of the things you mentioned was being able to migrate save files from other platforms. How are you doing that? Is there a handshake that needs to happen where, say, Uplay needs to allow me to migrate my Division 2 save? I wanted to be clear from the get-go that, what were the principles that we were going to be approaching multi-layer. As a 21st century platform, frankly as a Google platform, being open is really important to how we approach this. It wasn't a dig at any of the incumbent first-parties but it was more a “let's be clear about what our philosophy, which is we want to be open, we want you to bring your progress from another game state into Stadia.” Then the example you just gave, for example, your Uplay account is the point of arbitration between the other platforms is exactly how it would work in practice. But saying you're open to it is different from saying you've spoken to the Steams, Uplays, and the Xboxes of the world. Do those conversations still need to happen? That would happen at a publisher and developer level. Now you kind of get into the politics of it, which I really don't think we have a voice in really. It's down to the relationships between the developers and the platforms. Clearly, that change is happening. We're seeing some games that have already bridged successfully, other games that haven't. It's a trend we just wanted to be really clear about what our point of view was, then hopefully within months this all gets resolved for the benefit of the gamer. When you're talking about the possibilities for the developers to harness this technology and do something new and different and foreign looking, what are those opportunities you see that seem to be the most promising? I think most platforms historically, certainly I've been in this position in the past, have focused on graphics as the point of difference. This platform is better because it does X more polygons or more wizzy graphics. I think with Stadia what we have focused on is what can make gameplay better? What can make gameplay different? This idea of the data center as your platform, what does that mean for bringing ML and AI into the experience using amazing Google technologies that have historically been a bit out of reach for game developers. We can bring that to play, literally to play here. We have a microphone in our controller that you can use at your choice to have a conversational understanding with an NPC in a game. That's a fabulous promise of what that could mean for the future of games. So those are the areas that I'm really excited about. Then at a more macro level, this idea of how games are being designed today to be both played and watched and how we can bring that together. Even sitting down with really smart and forward-thinking designers and developers, they're already starting to think about, “okay I've got a game producer and I've got a broadcast producer” and they start to think about bringing those two skills to bear at the fundamental design of the game. I think that's where we're going to see some dramatic innovation. When you launch later this year, what kind of infrastructure do you have in place? I know you mentioned parental controls are already a part of the equation. What about friends lists? What kind of solutions do you have in place for that stuff? We'll go into the details in the summer, but just at high level, rest assured, yes, we have what you would call a platform for gamers. That will allow you to have the social features that you would expect.